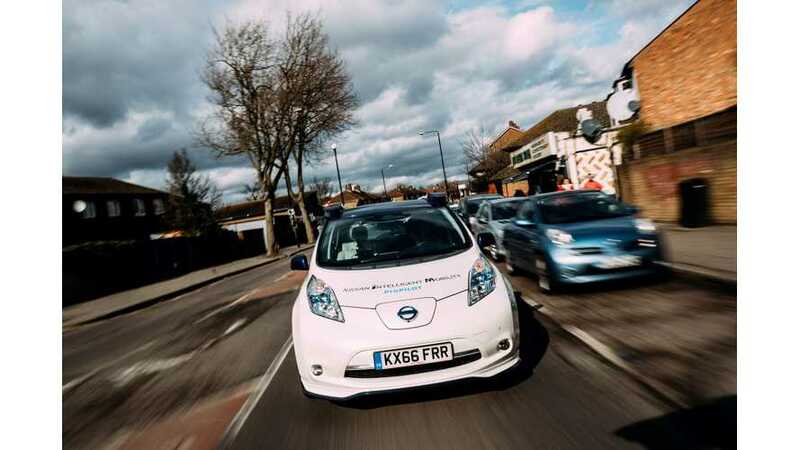 Fully Charged had chance to test drive the autonomous Nissan LEAF that recently was demonstrated in London. The Japanese approach is to offer fully autonomous driving capability with ability to take control of the wheel at any time - for the joy of driving, or when situation will become extraordinary. Fully Charged notes that the autonomous LEAF feels solid and safe. We have to say after watching the video it is impressive how far Nissan has come with its system, and can't wait to get our hands on it in the 'next' Nissan LEAF. For now it's just a prototype, with four lidars, 12 cameras, and many separate computers for each of sensor, which will need to be integrated in single unit at later stage. Otherwise 1.5 kW of power usage by the system would affect range too much. "Our first ride in a fully autonomous car on public roads in the UK. Nissan very kindly arranged this experience, I'd particularly like to that Tetsuya Iijima, who is 'not' driving the car, he had been showing this vehicle to numerous journalists before we arrived but still showed great enthusiasm."